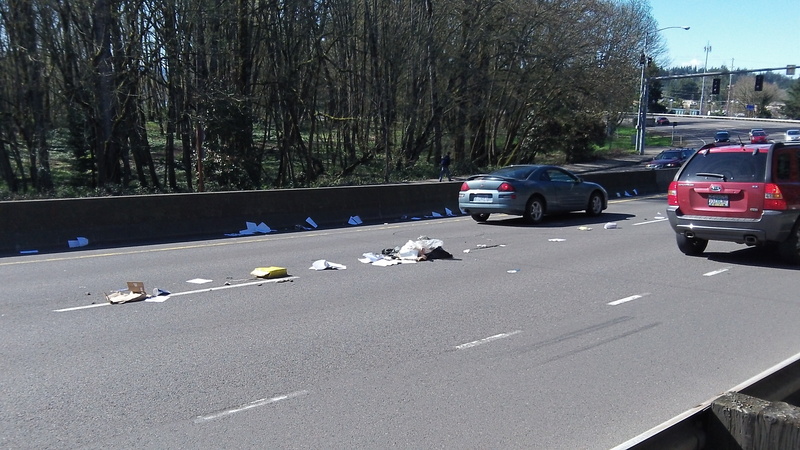 What you can’t hear me saying in this video, on account of the traffic noise and wind, is that if you lost a bag full of trash on the highway and you knew you had lost it, you would make an effort to stop and pick it up, right? That didn’t happen Tuesday afternoon on the north end of Albany’s Lyon Street Bridge. I passed by the spot on Highway 20 just after 3 o’clock and saw how drivers were trying to avoid a blizzard of wind-blown papers. I turned back first chance I got, parked and walked back to the scene of the spill.